Imagine a country so dry that you have to build a 10-level stepped structure going down into the earth to get water. Such is India, where thousands of ingenious stepwells were built from the 2 nd century AD through the 19 th century, many financed by philanthropists, to whom the parched population were entirely grateful. This was before sophisticated technology allowed people to pump water from deep in the earth. Many stepwells have been abandoned and are in disrepair since the introduction of modern waterworks, plumbing and village taps. Some have been destroyed. Because the water table is even lower in recent years, many are now dry. Victoria Lautman, a freelance journalist in Chicago, has been traveling around India documenting stepwells before more fall into dereliction are destroyed by neglect or outright demolition. Some stepwells are simple, while some are of elaborate design, as can be seen in photos in an essay titled “India’s Forgotten Stepwells” that Lautman wrote for ArchDaily. “I’ve seen roughly 120 now, in eight states, and I can’t seem to stop,” she wrote in an e-mail to Ancient Origins. “Their beauty and mystery continues to amaze me and I cannot bear the fact that so many are crumbling to dust, forgotten and decrepit. But I never intended to become a Stepwell Champion, I was just pursuing my interest at the time. She wrote on ArchDaily that stepwells were built because the climate in India fluctuated between being sere for part of the year, when water was scarce, and then swamped with monsoon rains for many weeks. She said the entire architectural category of stepwells is in danger of disappearing. So she has undertaken a survey of them and is trying to bring attention to them so they can be saved before it is too late. Part of the reason for their falling out of use is that the British Raj deemed stepwells unhygienic and breeding places for disease and vermin and had many filled in, barricaded or destroyed in other ways. “It was essential to guarantee a year-round water-supply for drinking, bathing, irrigation and washing, particularly in the arid states of Gujarat (where they’re called vavs) and Rajasthan (where they’re baoli, baori, or bawdi) where the water table could be inconveniently buried ten-stories or more underground. 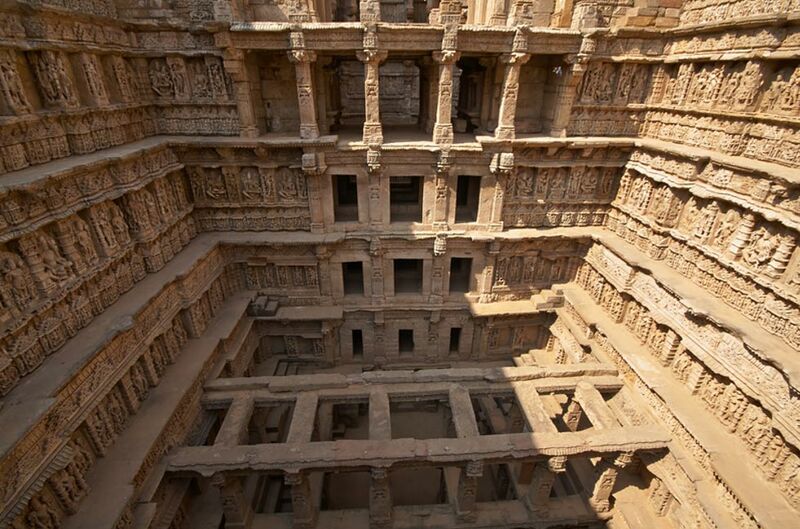 Over the centuries, stepwell construction evolved so that by the 11th century they were astoundingly complex feats of engineering, architecture, and art,” she wrote on ArchDaily. The stepwells were dug deep into the ground and lined with masonry. Workers commissioned by rich people, including many women, built steps, in some cases more than 100, going down to the water table, the level of which fluctuated. In drier seasons, the water was lower in the structure. In rainy seasons, the water could be very near or at the top, meaning less of a trek downward to obtain water. To construct a stepwell, workers dug a deep cylinder and place a stone-lined trench beside which a long staircase and side ledges were built. Water flowed into the trench from an opening in the well cylinder. “Stepwells fall into similar categories based on their scale, layout, materials, and shape: they can be rectangular, circular, or even L-shaped, can be built from masonry, rubble or brick, and have as many as four separate entrances,” Lautman wrote. She said no two stepwells are identical and each has a unique character. Some are utilitarian, some complex. Some have statuary depicting Hindu deities, to whom the stepwells were dedicated. Lautman said some stepwells were like “bona-fide subterranean temples.” Hindu stepwells were places for prayer and ritual bathing, and some are still in use as temples today. When Muslims conquered different parts of India through the years, they halted the practice of representing deities, people and animals in the ornamentation of the stepwells because of an injunction against graven images. But some of the stepwells commissioned by Muslims were beautifully ornamented too, Lautman wrote. Hindu builders employed post and lintel construction with corbels to support domes, but Muslims used arches and true domes. Now many wells are dried up because of unregulated pumping, or when the water is present in some cases it is covered with algae or plant growth. Lautman says stepwells are also being used as garbage dumps and latrines. Some have been mined for stone for use in other structures. Others are crumbling from lack of maintenance. Some have been destroyed. Seeing these designs, makes me feel like architects nowadays don't deserve even 5% of their paycheck.